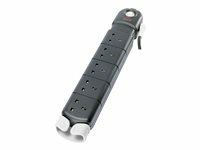 Catastrophic Event Protection - SurgeArrest components such as MOVs and Thermal fuse ensure instantaneous reaction to lightning strikes and wiring faults. 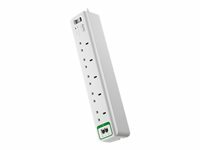 If the surge components are damaged due to power spike or over voltage, excess power cannot reach your equipment. 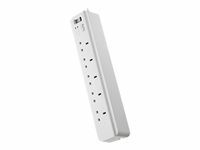 Unlike the APC SurgeArrest products, most surge suppressors continue to let power through even after circuits have been damaged, leaving your equipment exposed to other damaging surges. EMI and RFI noise filtering - Reduces line noise that can cause data loss and keyboard errors. 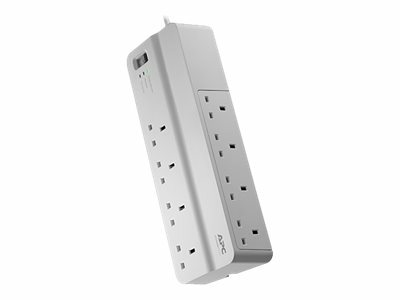 IEEE let-through ratings and regulatory agency compliance - APC surge protectors undergo stringent testing by IEEE, and are awarded "let-through ratings", which indicate the maximum voltage level that can possibly reach your equipment after a surge or voltage spike has passed through an electric surge protector. Lower IEEE let-through ratings indicate better protection and performance. The APC Essential SurgeArrest series offers optimal performance with a let-through rating of less than 330V for North American products, and a rating of less than 15% for products sold worldwide. All APC products comply with local agency safety requirements, including UL in North America and CE/Kema/Gost/C-tick/A-Tick/Telepermit in their respective regions. Protection Working Indicator - SurgeArrest will warn you if its circuitry has been damaged by heavy strike or power line surge and it is unable to provide 100% protection. 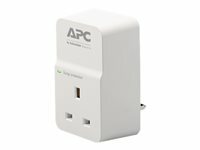 If still under warranty, APC will then replace your damaged SurgeArrest free of charge. Noise Filtering - Attenuates EMI/RFI line noise that can cause data errors and keyboard lockups, ensuring better performance of protected equipment. Lightning and Surge Protection - To prevent damage to your equipment from electric power surges and spikes. Fail Safe Mode - Most other surge suppressors continue to let power through even after their circuits have been damaged, leaving your equipment exposed to future surges. APC's SurgeArrest fail safe, which means that once the circuit of an APC SurgeArrest has been compromised the unit disconnects equipment from the power supply ensuring that no damaging surges reach your equipment. Data-line Protection - Protection of data lines (Ethernet, Coaxial and Phone lines) ensures complete protection of your equipment from surges. It is very important to protect your equipment from “back door” electric surges traveling through data lines, as they can be as damaging to your equipment as surges traveling over power lines.